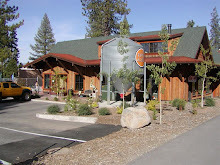 Whats happening at FiftyFifty Brewing Company... Up to date information from the brewery and the restaurant. Of course all the latest info coming from the brewhouse. Weekly 'what's on tap' updates and frequent thoughts on what is coming up next from our vast array of specialty brews!!! It's certainly a fun story... The base beer for our Imperial Eclipse Stout has done it again. Bronze for the big beer that could. The 2009 GABF in Denver is in the history books and FiftyFifty Brewing Co. has made it in there yet again. The competition which was huge this year with over 3300 beers entered into 78 categories seems daunting to even the biggest breweries. Nearly 500 breweries were in the mix this year yet only 45 'small brewpubs' took medals...in which we were one. Our medal came from the Other Strong Beer category which pits beers of various types against each other that are made 'bigger' than the recommended style guidelines. Ours being an 'Imperialized Oatmeal Stout'. Also worthy of noting is we medaled in this category last year as well which is also a notable feat unto itself. We have a keg of this Stout going on tap soon at the pub as we held it back for just such an occasion. Speaking of Eclipse, myself and several BA's opened my last bottle at the Verdugo in Glassell Park (Los Angeles) last night. Everyone thoroughly enjoyed it. And we NEED to know if there are still more bottles of the 2008 left and when the 2009 will be released!